Fr. Paul Marx, O.S.B. was a pioneer in the worldwide pro-life movement. He became involved in the movement in the 1960s, writing his first pro-life news article in 1967. Fr. Marx had a Doctorate in Family Sociology from the Catholic University in Washington, DC. He did post-graduate work at Harvard, the University of California at Berkeley, and the American University in Washington, D.C. He was ordained to the priesthood on June 15, 1947 by the Order of St. Benedict. After nearly two decades on the faculty of St. Johns University, he was permitted by his order to work on pro-life issues full time. He undertook the task of spreading the pro-life message with his characteristic vision, leadership, and energy. In 1972, he started the Human Life Center at St. John’s University in Collegeville, Minnesota. Moving to Washington, DC, Fr. Marx founded Human Life International in 1981, and the Population Research Institute in 1989. Fr. Marx wrote more than 13 books, including The Death Peddlers, his most famous work. In 1973, concerned about euthanasia, he wrote The Mercy Killers. Well over one million copies of this book, warning of the dangers of legalized euthanasia, were sold or distributed in the English-speaking world. In 1997, Fr. Marx wrote his autobiography, Faithful for Life. Fr. Marx visited some 90 countries of the world to promote the pro-life cause, working to defend life from conception to natural death. 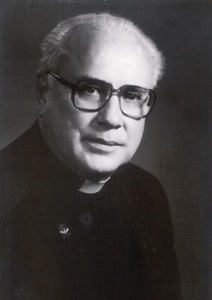 In retirement, he lived at St. John’s Abbey in Collegeville, Minnesota, but remained active as the chairman of PRI’s board.